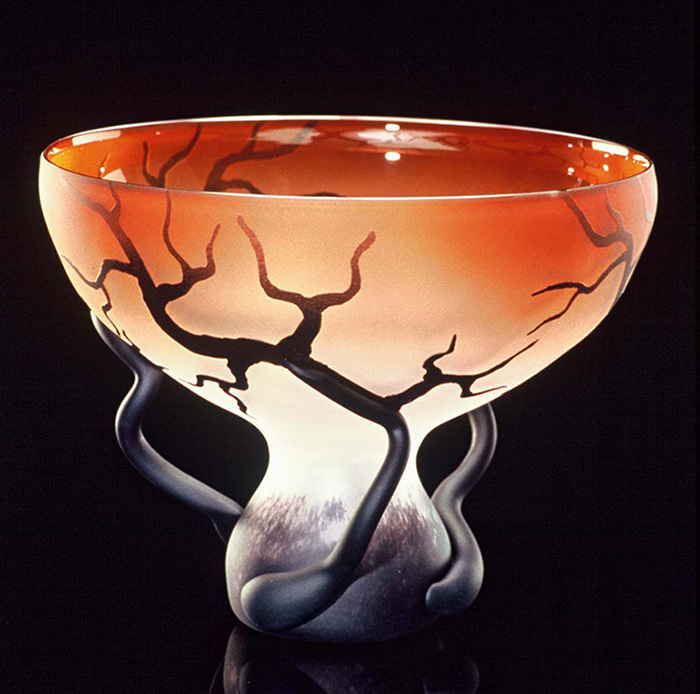 The Chalice Root sculptural art glass bowl is hand-blown by Bernard Katz. The fluid yet controlled form creates the illusion of organic growth. Often asked, “Are the dark colored vines or branch like parts glass?” Yes, the Chalice Root is all glass. The three dimensional elements are applied during the final stages in the hot blowing process. Like most of the work we do, blowing the piece is just the start. It then begins its long journey through the cold working process of masking, sandblasting, grinding, etching, and finishing applications. Finally, the Bernard Katz signature.